In this episode, Matt and Erin talk about managing twospotted spider mites in soybean. Considering other pests is important, given the non-target effects with an application. This is particularly true if soybean aphid is in the field because of recent reports of pyrethroid resistance. They discuss options, including using miticides to suppress mite populations. Implications of pest ecology and economics plays a part in managing soybean pests. 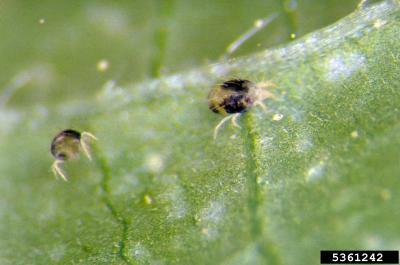 Twospotted spider mites. Photo by Frank Peairs; www.ipmimages.org.